The word ‘REDESIGN’ is enough to cause a headache to many app designers and developers. But in order to achieve optimum performance, it is necessary to redesign your app. Though stability, performance and functionality are important to measure the success of a mobile app, the first thing that a user will notice in any mobile application is its design. The design of a mobile application is the first and foremost thing that will catch a user’s eye. If it is not attractive and user-friendly, chances are that they will move towards other options. 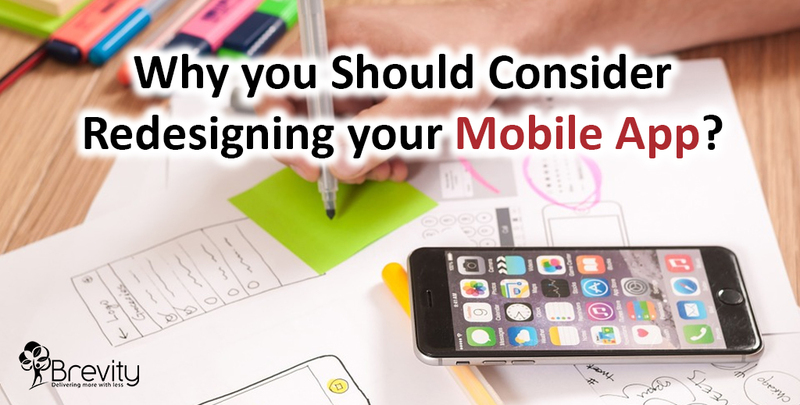 So, if you are still thinking whether you should redesign your mobile app or not, take a look at the below points to know why you should consider redesigning your mobile app. The first and foremost reason for getting your mobile app redesigned is the low metrics. However, there can be many reasons for this but even after eliminating all of those if you see a downward trend in the conversions, downloads and users, it is an indication that your app needs redesigning. You can know which part of your app needs redesigning by finding out where in the entire workflow of your app the design is breaking and then addressing those issues as top priorities. Sometimes redesigning can be as small as just adjusting the conversion funnel design while some can be as large as changing the whole design of the app. Based on the analysis of from where your potential customers leave your app, you need to decide your redesigning requirement. Design norms keep changing over time. OS developers often change the design guidelines. For example, Apple’s transition from iOS 6 to iOS 7. These change in guidelines indicates that it’s time to redesign your app. Though it may be frustrating for the developers, it will be eye-soothing for the users as they will get a new and latest interface. How do you feel using a Windows 95 application in this era of Windows 7,8 or 10? Doesn’t that look traditional to you? In the same way, your application too starts looking outdated and traditional with time. Although your app might have created a hype when it was first launched as time flies, aesthetics evolve. At this point, an old design will be harmful to your product further leading to decreasing metrics as discussed above. And that is why you need to revamp your app. It is not necessary that you follow every design update, but it is advisable to change the design from time to time. But the question is how do you know that your app is outdated? Very simple. Just look around you. Take a look at competitor’s app designs and at the design of prominent brands who are performing very well in your niche. This will help you to know what you are lacking in your app. This means that if a normal, general function in your app takes more time than it actually should, it is time you should think of redesigning your app. Otherwise, due to such inefficiencies, your users might move towards your competitors. For example, when a task takes 6 steps to complete when it should actually take only 3, you should redesign that task or functionality. If you want to port your app developed on Android platform using Android design guidelines to iOS platform, then it is necessary that you get it redesigned as per the iOS guidelines for the iOS platform. Some customers prefer to port the same application to another platform. This may sound feasible from the budget point of view but it is not advisable as different platforms have different design norms. Customers often accommodate a large number of functions within a single application to make it functionally-rich. But adding too many functions in one application might make the application messy and complicated. Too many sidebars, menus, toggles etc. can confuse your users. So, it is beneficial to keep your application as simple as it can be. If the users won’t understand the workflow of your app, they might end up moving to the next best option available. If you have changed the logo, corporate structure or handbook content of your company, then you need to reflect the same in your mobile application too. This means if you are rebranding your company, you need to redesign your application accordingly – change the logo, color theme etc. These are some of the reasons why you should consider redesigning your app. Delivering a fresh look and interface will yield more customer acquisition, conversion and retention. Redesigning is one of the most important factors to stand out in this competitive mobile app development world. If you have an application that hasn’t been updated for years now and you want to redesign it, then contact us. We will revamp your application to give a fresh look to your app users. We can also help you to create a brand new application for your business.